How often does shopping from your favorite brand make you feel the pinch on your pocket? Before you decide to let go of your brand, try checking out these export surplus stores to find exactly what you are looking for at cheaper rates. What brand they wear often becomes a style statement for men. Male square brings to you brands like Allen Solly, Arrow, Van Heusen and Louis Phillippe and many more and that too at not so expensive rates. Men can find both formal and casual wear. You can find T-shirts starting at INR 800. For shirts, the starting price is INR 2000 and for jeans the same is around INR 2500. The store opens all days of the week from 10:00 a.m. to 9:00 p.m.
Why should be anyone be deprived of wearing branded clothing? Just Casuals have something in store for everyone in a family, be it men, women or even kids. Keeping a collection of surplus, excess inventory, cancelled shipments, out of season stocks, out of color or out of size ratio stocks, they have a great variety for all. They provide brands like Buddies, AWC, Smitten, Pretty Miss Lucy and many others. Their starting range for ladies tops is INR 180 and that for kurtis is INR 500. Men can find T-shirts at just INR 400 and shirts at INR 800. They are available seven days a week from 11:30 a.m. to 9:30 p.m. Even though many would know about this store, not many would know that the prices at which branded products are available here are comparatively cheaper than their actual prices. Catering to everything from men, women and kids wear, to accessories, home and beauty products, lifestyle is another store to look out for. Even there clearance section is worth visiting, it may surprise you. All brands like Adidas, AND, Bossini, Vera Moda are associate with this. You can find a casual shirt at INR 439 only and jeans at just INR 599. Women can find lovely dresses at just INR 699 at the store. The stores open all days of the week. If you are in love with variety, this is the place for you. With 200 brands associated with them, Brand Factory provides almost everything kind of clothing catering to all kinds of customers. 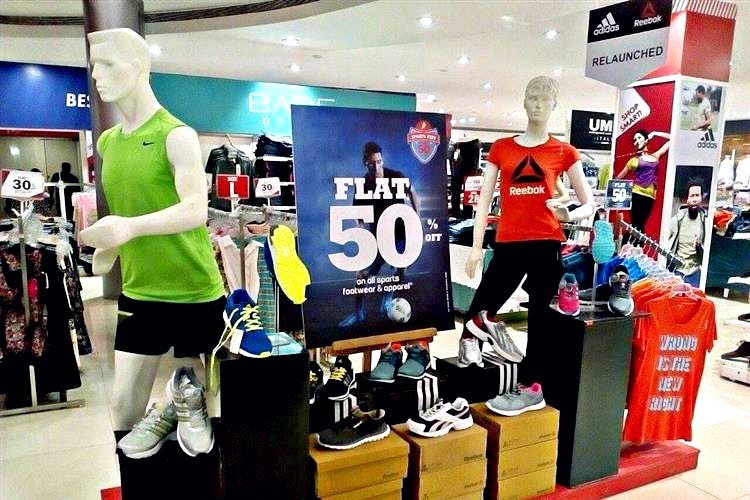 They have men’s wear, youth wear, women’s wear, sportswear, kids wear, footwear, accessories and more. And all these from brands like Pepe Jeans, W, Wills Lifestyle, Wrangler, Gini & Jony, Allen Solly, the list could go on. They provide 20% to 70% discount on all these brands. They are open all days of the week from 11 a.m. to 9 p.m.